In a skillet, heat 1 tablespoon oil. Sauté the onion for 2 minutes, over medium heat. Add the chili paste, kale, salt and pepper. Sauté for 2-3 more minutes. Mash the potatoes, and mix into the cooked kale. Add 1 egg and mix well. In a cup, mix the yogurt, cumin, lemon juice, cilantro, water, salt and pepper, until smooth. Set aside. (You can do this in the blender if you want). Cover a dish with flour. Take 1 tablespoon of the potato and kale dough, and form it into a pattie. Put it on the dish covered with flour, and continue with the rest of potato and kale mix. Put the panko in one bowl, and beat two eggs in another bowl. Heat 2 tablespoons oil in a large frying pan over medium heat. Pass each pattie through the eggs, so that they are covered completely. Then do the same with the panko. Put in the pan, and repeat with the other patties. Try to do this quickly. Cook each pattie for about 1 minute on each side, or until golden. Transfer to a dish covered in paper towels, to absorb the excess oil. Serve as hors d’oeuvres, as an appetizer, or as a side dish, with the yogurt sauce as a dip, or poured over each pattie. 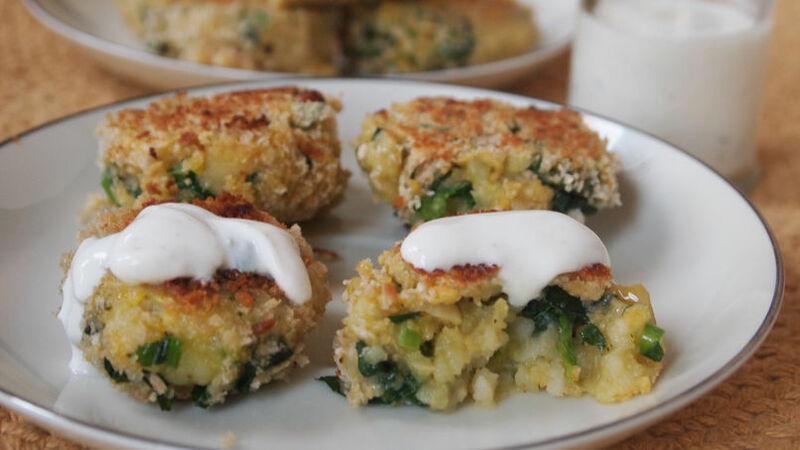 Use mashed yucca instead of the potato, or mixed with it, to give these patties a firmer texture. Make larger patties and serve them as veggie burgers. One of my favorite Peruvian dishes is called papa rellena (“stuffed potato” in Spanish). This dish is of Arab descent, and consists of mashed potato dough formed into the shape of a football, filled with minced meat, and pan-fried. I like it filled with soy meat, cheese, or vegetables, and always with rice on the side and salsa criolla on top (Peruvians serve absolutely everything with rice on the side and salsa criolla on top!) The other day I had a bunch of kale in the fridge, and I started imagining all the dishes I could make with them. Papa rellena was one of the first ideas that came to mind, because a kale stir-fry would be a wonderful filling for this dish. This idea then deviated into a bite-size version that one could serve at a dinner party to feed some delicious, seasonal kale to their guests. This is how these patties were created. I hope you enjoy them!